Josh and Emily did it! They've cured their poisoning, restored their HP, and are still experiencing an XP boost from last Sunday's mukbang livestream. Josh has been using his health to pursue more Pokémon Go adventures, Emily has been using hers to put the finishing touches on a VGM karaoke, and as always, they're bringing you some fantastic patron recommendations. Join your hosts as they contemplate installing edgy video games on teachers' computers, the nature of NES waveforms, crying live on the internet, and the unexpected directions of the Tamagotchi franchise. So hug a little longer, make it last a little longer, and enjoy some long-lasting freshness at the VGM Jukebox. SPECIAL ANNOUNCEMENT: Dear patrons, you are cordially invited to eat dinner with Josh and Emily this Sunday, March 26th, at 6 PM Pacific and 9 PM Eastern! Join us on our Twitch channel at twitch.tv/vgmjb for food, chunes, and chats. Hope to see you there! Did you know that biological viruses can be transmitted through the internet in addition to digital ones? This week the tables turn as Josh’s health returns and an extremely congested Emily has to podcast from under a blanket. She’ll be all right, though, thanks to the patrons who donated Master System platelets, and also to the energy-infused, patron-submitted VGM Karaoke that literally clears her sinuses. Also reminisce about a time before the internet and when ice skating scandals rocked the world, and get an exclusive behind-the-scenes exposé on the highly anticipated upcoming radio drama, Capcom Girls. So cuddle up under a blanket (again, for equality's sake) and sink into a pillowy limbo with the VGM Jukebox. Exactly who are the keytarists of the world? Are they the chillest dudes? Or the most uptight nerds? Emily and Josh go into versus mode on this episode to try to figure it out. Join a sick Josh and a healthy Emily as they take more excellent requests and talk about button shapes, Stick Stickly, Japanese pronunciation, and the function of slatted shades. Mostly though, a particular keyboardist. OMG! WHO IS THIS GUY!? Also, get a new sentimental karaoke from a premier VGM karaokeist from the future! 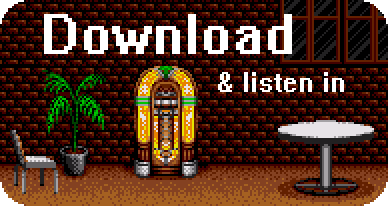 So cuddle up under a blanket and get comfy with us on the VGM Jukebox. Oopsy. Did you die? Don’t worry. This week’s episode has just enough MP to bring you back from other side (thanks to Emily). Join us for the first VGM podcast to include a biology lesson as Emily and Josh discuss squamous cells, interstitial matrices, and the impressionistic fate of a piece of paint. Stick around to find out just how important certain vowel sounds can be. Last but not least, listen in as a new Keyglyph karaoke gives Josh sideways nostalgia for the place he already lives. All this (and the sound of heavy machinery) this week on the VGM Jukebox!